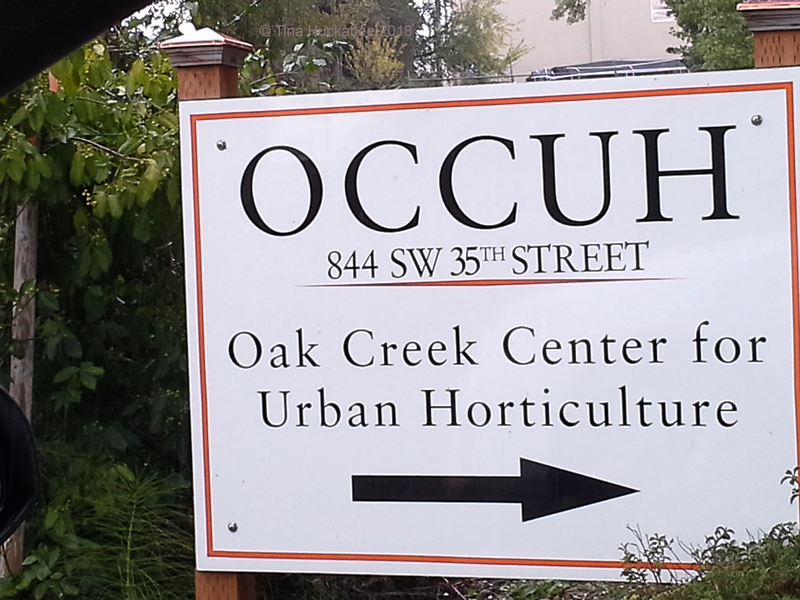 A few years back, I visited the Oregon State University (OSU) Oak Creek Center for Urban Horticulture which is a 6.5 acres space dedicated to research involving sustainable agricultural practices. OSU is well-know for its horticultural programs. On a partly cloudy, cool and breezy autumn day, I wandered the fields of experimental and heirloom vegetables, lined with perennial gardens abloom with pollinator plants. During the walk, I happened upon a charming apiary hosting an array of beehives. Tucked in a shady grove, the apiary was adjacent to a lab located in an older home renovated appropriately for the work of horticulturists and entomologists. The delightful OSU apiary showcases different types of bee homes and augments research about and demonstrations of commercial and home horticulture. At the time, I wasn’t yet a backyard Bee Mama, but was definitely interested and learning about the buzzy beauties. I took photos of the apiary, dutifully downloading them to my computer upon my return to Texas, fully intending a post about the apiary. I focused on writing about other gardening subjects near and dear to me, though I certainly recall the apiary adventure and planned a post about the apiary. Recently, with year-end/beginning-of-year photo file tidying, I was reminded that the ‘OSU apiary’ folder was awaiting its turn for a blog post with a round of accompanying photos. 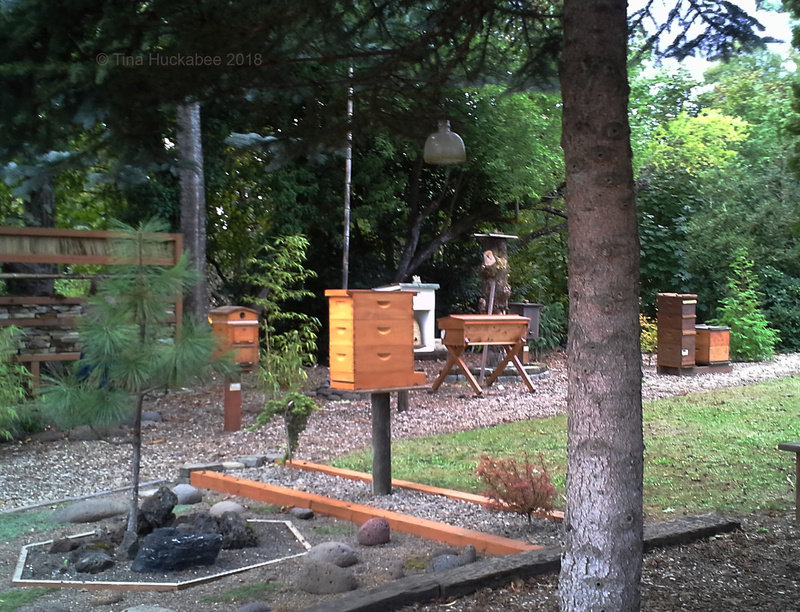 On that lovely afternoon in Corvallis I meandered along a mulched pathway and viewed a variety of beehives which sat, perky and productive, in service to honeybees buzzing in and out and all around, going about their important business. 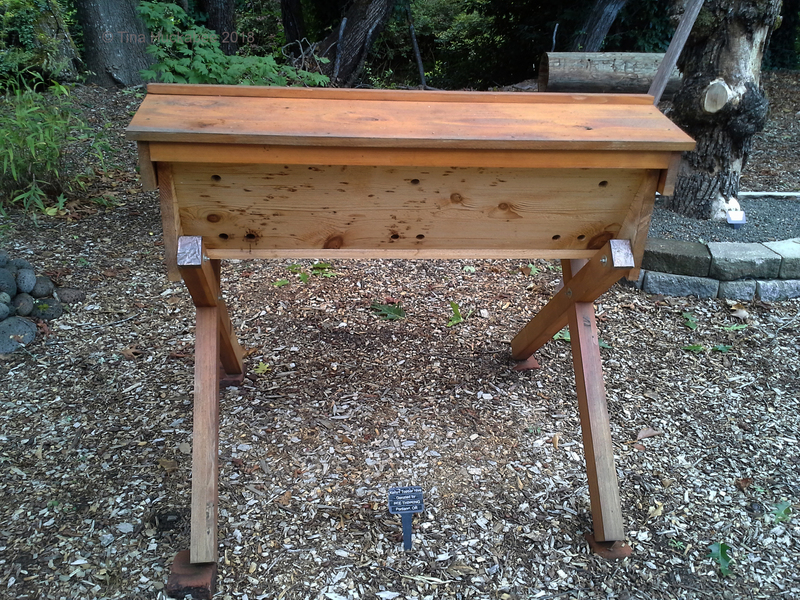 The classic Langstroth hive is a staple of any honeybee hive demonstration. These two hives are each stacked with three brood boxes, or deeps. This is where the queen hangs out, laying eggs and being taken care of by the worker bees and where the workers tend to the other tasks for hive integrity–making comb and honey and cleaning the hive. At the bottom of these hives, the entire length of the box is open about a half-inch tall for the bees’ entrances and exits. This is called the bottom board. 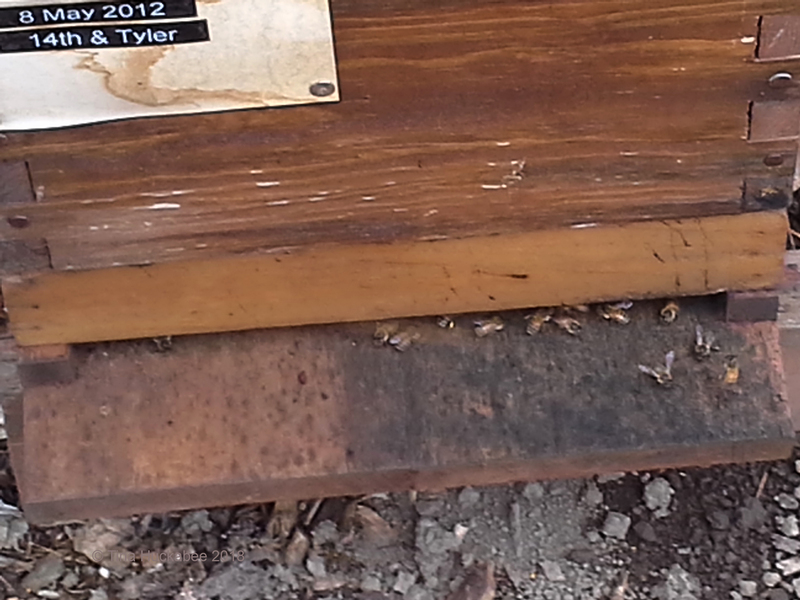 I typically reduce the bottom board opening to my hives so that my bees don’t have to defend a large area; I leave about 2-3 inches for their comings and goings, but I think the standard practice is demonstrated above–leaving the entire width open. I like this hive! Just in case you’ve just landed from outer space and you have no idea what these stacked boxes are for, there’s a bee door ‘knocker’ of sorts which may give you a clue! I’ve often seen honeybee hives painted white, but I prefer boxes of natural wood, or boxes painted in brighter colors, as well as bee boxes with painted decorations or decals. You’ll notice that each of these boxes differ slightly in height. The taller box is the brood box which houses the queen, larvae, workers, and lots of honeycomb. The shorter boxes are called supers and contain honeycomb (and worker bees of course! ), but no larvae. Once a hive is robust, a beekeeper may place a super at the top of the hive so that the honey is more easily extracted without damaging the queen and larvae. For those supers where the keeper only wants honey for extraction, the queen is prevented from crawling into the shorter boxes by a mesh called a queen excluder. The mesh is too small for the big-thoraxed queen to squeeze through, but worker bees are svelte enough to easily manuever as they go about their daily routines. In the white Langstroth above, the strip of unpainted wood between the top and second-to-top box is probably the queen excluder. 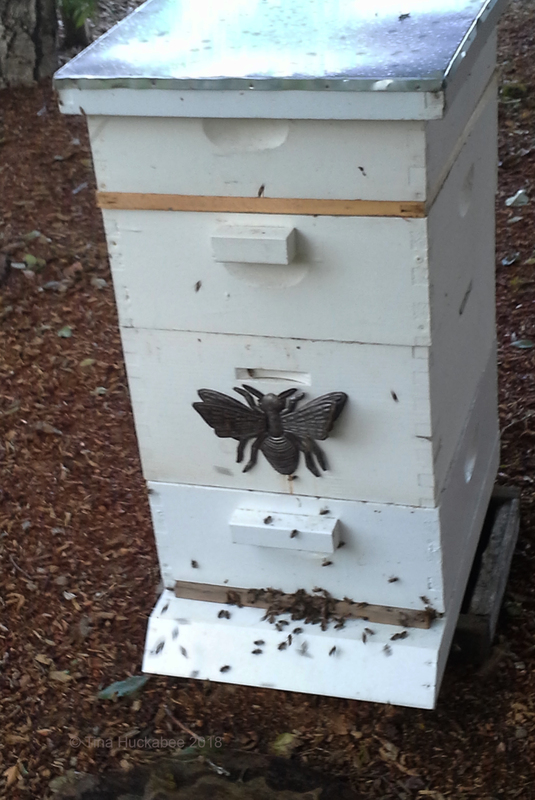 In some hive management techniques, beekeepers will rotate boxes, placing a super at the bottom of the hive; you can see that demonstrated in the above photo. With honeybee hive displays, it’s always fun to see the innards of a hive. 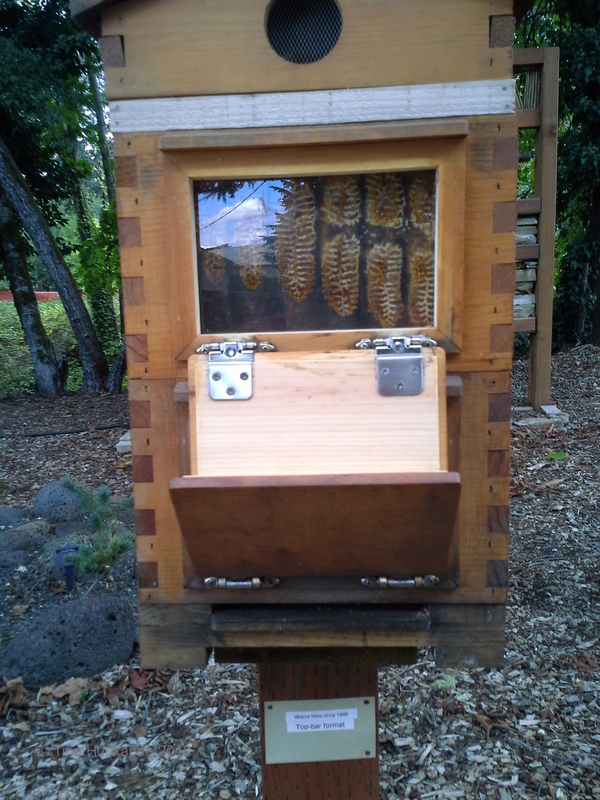 This one demonstrates the workings of a top bar hive. I liked this one! It was a replica of an ancient Greek hive, discovered in an archeological dig. This pot was thrown by a local Corvallis potter; she threw the pot, carving an opening at the bottom for the bees. I think this would make a very hot hive in the Texas summer, but perhaps Oregon is cool enough for a ceramic hive to function. Have an old commercial plant pot sitting around and don’t know what to do with it? As I recall, this makeshift hive was just such a pot. The beekeeper drilled holes for the bees and placed cut wood atop the pot. It’s a bit slap-dash for my taste, but there were bees living in it, so I guess it works just fine for a hive. 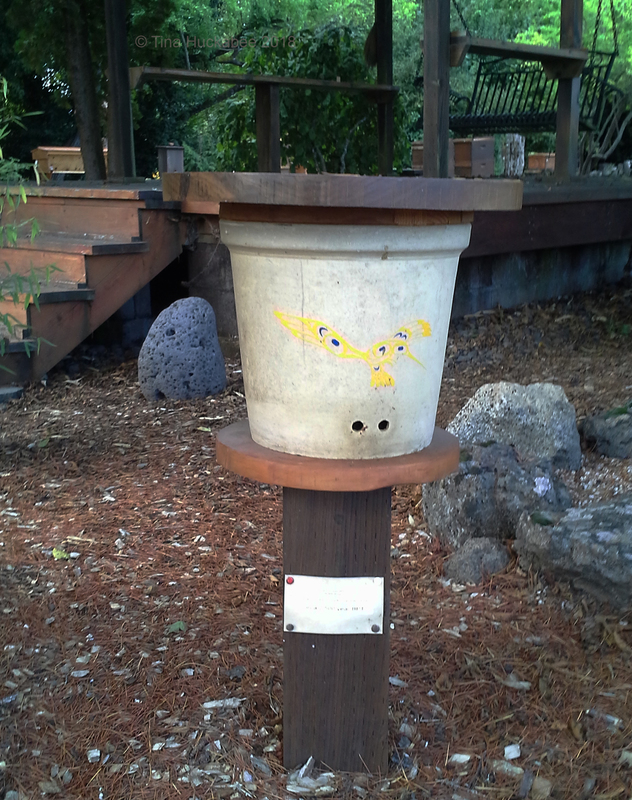 The apiary wasn’t just about honeybee hives, but also hosted examples of native bee/insect hotels. Bee Daddy constructed our honeybee hives first, but we’ve since added Bee Daddy built bee/insect hotels for our native bees, which you can read about here. 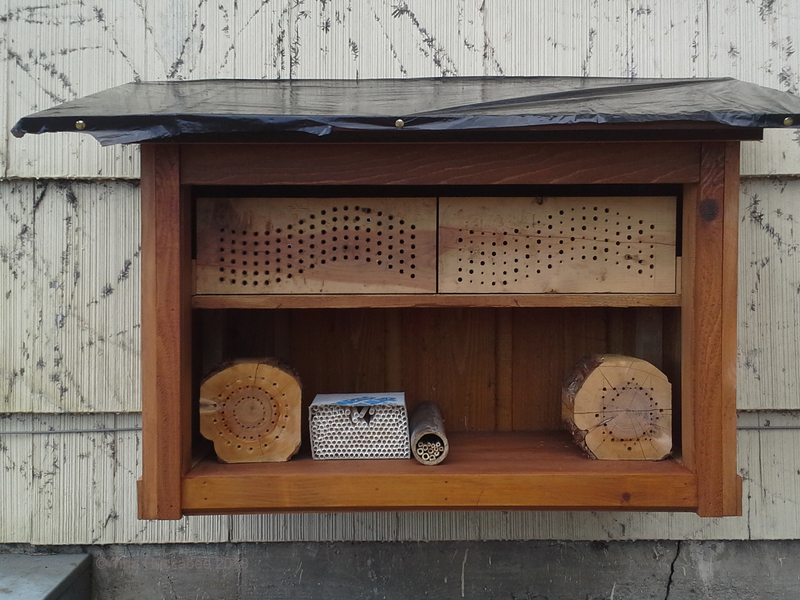 If you want bees, but don’t have the time or interest in honeybee hives, check out the many designs for native insect hotels on the internet. They’re easy to make, and it’s fascinating to observe and learn about native bees. Native bees are even more threatened–and arguably more important for our ecosystems–than honeybees. Leaving bare ground somewhere on your property, placing bee/insect hotels and cut limbs in the garden, refraining from pesticide use, and planting native and pollinating plants will help both the wild/native bees and the honeybees. I’ve been to Corvallis several times since the apiary visit, including for the complete solar eclipse in August 2016. Unfortunately, I haven’t returned to the OSU apiary, but I imagine that it’s still there, housing happy honey and native bees, and serving as a fun and interesting educational exhibition for people. 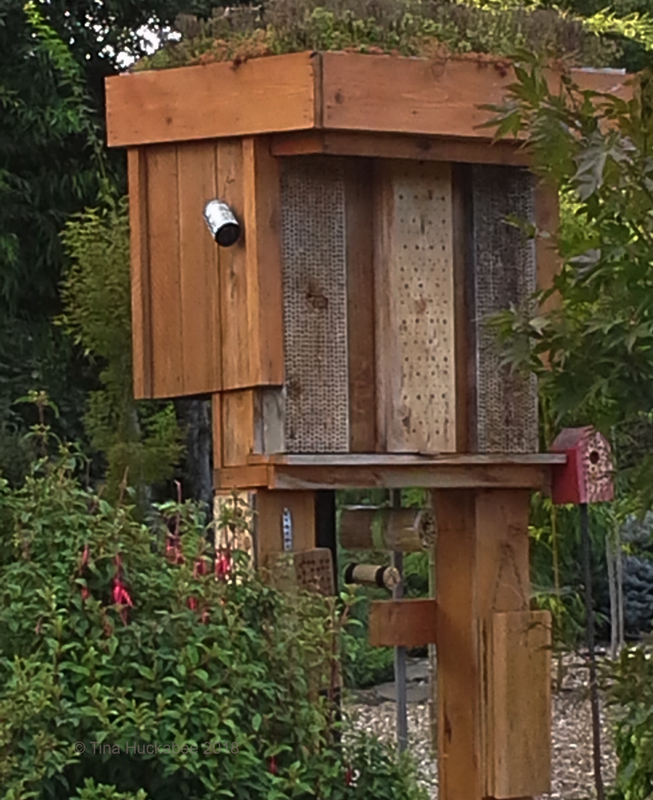 This entry was posted in Bee and insect hotels, Honeybee Hives, Honeybees, Native Bees, Uncategorized and tagged Oak Creek Center for Urban Horticulture, Oregon State University by Tina. Bookmark the permalink. Tina is a great post and full of information. The photos are excellent. I visited the OSU thanks to the photos and their wonderful comments. I did not know there were so many types of hives. The Langstrorth hive is the one you use, is not it? The white hive is also Langstrorth? But it is changed because the Queen is confined in a drawer with a mesh: this gives more honey. The Hive of the upper bar of Kenya seems more economical and easier to do. I love the picture that shows the hive inside! A Greek relic that is still used since ancient Greece, and the hive works. 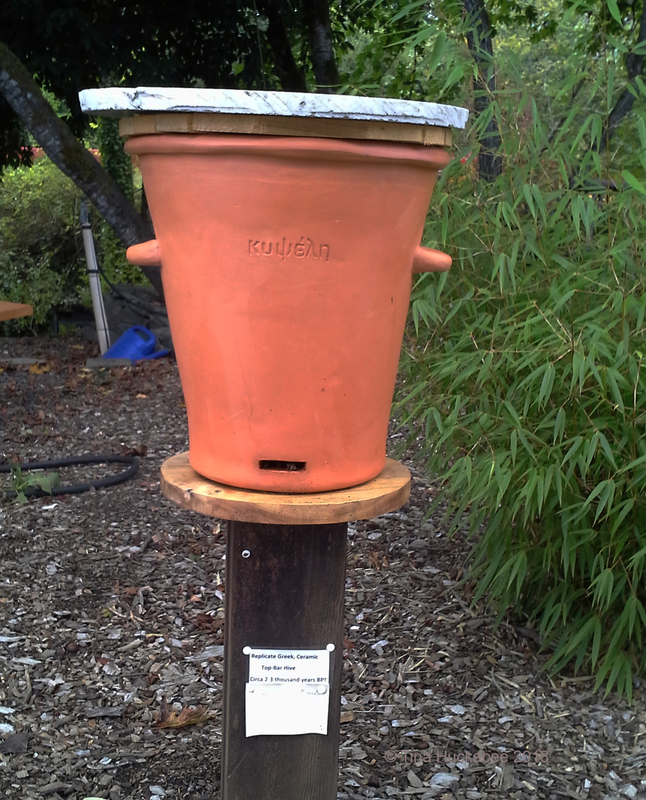 I love hotels for bees and native insects: this year I have to make one in conditions. Thank you very much Tina for teaching us so many things about bees: I like them a lot. Have a very good week. Greetings from Margarita. It’s amazing just how many different types of hives there are! 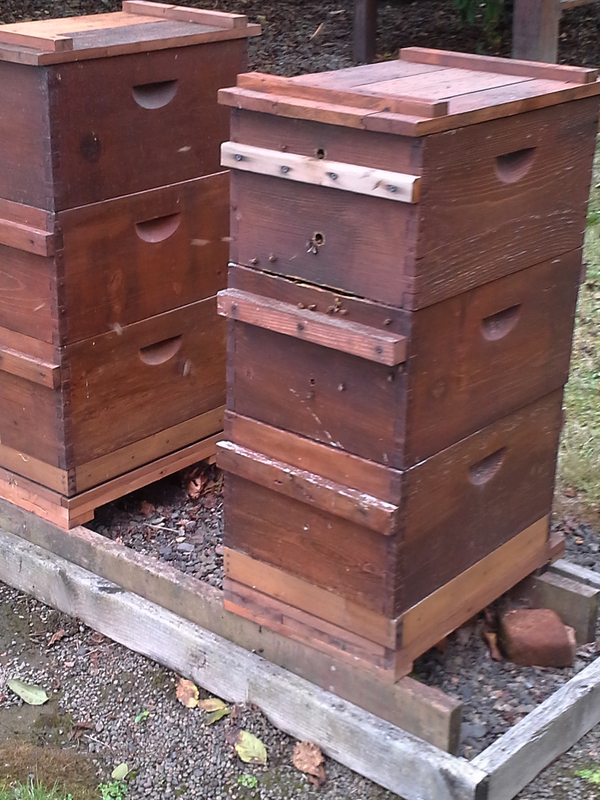 Yes, we now use Langsthroth hives and that is the type of hive most beekeepers use. And yes, the white hive is a Langsthroth; most of the hives you see that are stacked boxes are Langstroth, but there are some other rarer ones, like the Warre hives, that also stack. 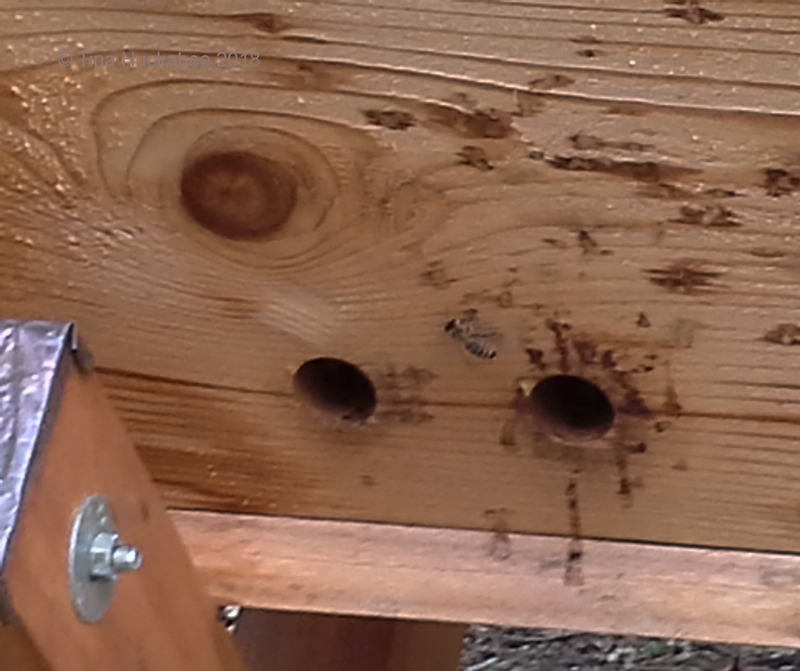 As for the “hotels” for the native bees, you can also lay wood (that has fallen or been cut from a tree) out (preferably in a protected spot) for the native bees that drill holes in wood. They’ll find the wood and viola!, you have a bee house! You have a good week too, Margarita. Some of those hives are too fancy for bees! They are better built than my home is! I imagine we all do that, you know, seems like a good idea but it’s about execution and the time to do so! It was a fun visit; I’m sorry that I haven’t returned.